Is the photo of the eagle and the stag real? So is it ACTUALLY real? Was the stag the result of a road accident? Yes and yes! Have we ever captured images like this? Not as spectacular, no! However, we have been using wildlife cameras for a long time. Not always on carrion but when we have the opportunity to we do. It helps us understand the activity in and around the forest. What other carrion? Without getting in to the debate of a growing deer population in Scotland, it is a fact that as part of the forest management here the deer numbers are managed and are managed in a respectful manner. What doesn’t end up in our freezer or that of friends and family is returned to the hill to let nature take its course. We are at peace with this process and are grateful that we can access food with zero food miles where the animal has lived as nature intended. We are fortunate to have had fantastic support from Jamie Boyle, the local RSPB manager, to continue learning more about the wildlife in and around the forest and to ensure the forest activity and wildlife can co-exist in the best way possible. Having remote cameras observe the activity is part of this journey. The activity at any carrion has attracted a variety or raptors including buzzards, ravens, golden eagle and of course this very impressive sea-eagle. Is there more to this picture? 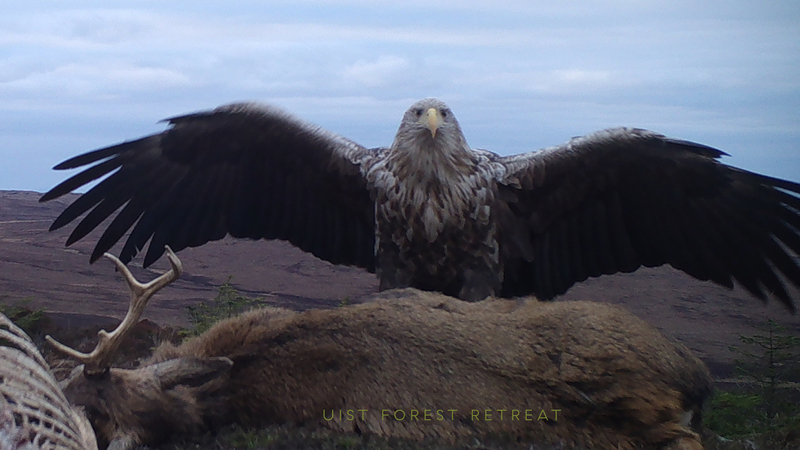 Jamie was actually with us the day we changed the card at this wildlife camera and when we got back to look through the images I can’t begin to express how in awe we all were and still are at the contrast of the sea eagle and stag in this way. Jamie’s colleagues at the RSPB were equally as excited and eager to share the image for understandable reasons. So for those who queried the authenticity of the photo we can tell you that the photo is very real! What our good friends at the RSPB did opt to do was to remove a rib cage from the bottom left hand corner as it was felt it distracted slightly from the point of sharing the image – the magnificence of this bird as it stood over the stag in such a manner. Had everyone known how far this image would have travelled perhaps there might have been a different decision but we can assure you this image was shared with the most genuine of intentions. Maybe just me but film doesn’t seem to be working. Hi Alan, thank you so much for letting us know. The video should be working now. Thank you for the extra pictures. I am glad to see all doubts put at rest and to see more. I hope to visit you and share the wonderful place you live in. Thank you that’s kind of you to say. I hope you can make it up here it truly is a beautiful place – we look forward to meeting you one day! Sorry Greg and thank you for letting us know. Our tech wizard has it working now we think – hope you can view now. Wow wow wow! Thank you so much. Nice to see size comparisons and the wee cheeky robin a the end ? Always make me wonder when people point at a buzzard and start saying look at the eagle ? Thank you for your comment Angus, you’re the first person to comment about the wee Robin at the end! The sea eagle certainly makes the buzzard look petite in comparison. There’s actually an image of the robin next to the eagle in the same pic but the light’s faded and not such great quality. Brave wee robin though! Good to see will be up again in June and Sept poss October and again in Jan. Barry. Thank you for amazing video, this is as nature intended, beautiful eagle gaining sustenance from a magnificent stag. No waste there at all. Thank you Jenny. We are also firm believers in no waste and appreciate your comment. Just been back to the video to spot the robin, what a fantastic contrast to the eagle. Love the different birds benefitting from the horrible road accident. Thank you Jenny. You are only the second to comment on the Robin not sure everyone catches sight of the little one! These are amazing pictures! Thank you for sharing the details of the origin of the pictures but more important, your reactions to seeing them as well. Somehow, this instructive background info helped me to appreciate while these pictures are beautiful to look at, they capture what may be mundane moments for the animals who are letting nature take it’s course during their life cycle. And that animals must be protected so they can have their mundane little moments on the planet we share with them. Thank you Anne. We are pleased we shared our story along with the images and that it has provided more context for those who view it. We really appreciate you leaving such a thoughtful comment. Truly stunning shots of such a magnificent bird! Thank you for sharing this. Hi Philippa, we’re glad you enjoyed it and thank you for leaving your comment. ‘Magnificent bird’ is a very appropriate description! Beautiful pictures! Looking forward to my Hebridean trip in May! What a size, that eagle! Thank you Kati, I hope you catch sight of one or more of the many eagles in the Hebrides! A fantastic capture! A wonderful sight. Thank you for leaving a comment Malcolm, it’s lovely to hear that you enjoyed the imagery.